There are of course many excellent initiatives, programmes and policies that seek to address some aspect of lifestyle diseases – quit smoking programmes, or exercise programmes, for example. 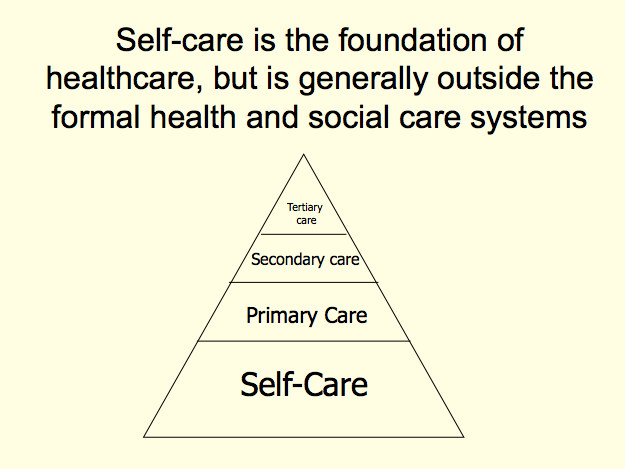 The ISF believes that such ‘vertical’ approaches are vital but that they could be further enhanced by setting them in a more holistic, ‘horizontal’ framework of self-care. Fundamentally this is how individuals should approach self-care – as a set of inter-linked activities. The risk factors for lifestyle diseases are themselves broad and interconnected – physical inactivity, obesity, tobacco use, unhealthy diets and the harmful use of alcohol in particular. The preferred approach is similarly broad-based and linked – for example, eating plenty of fruit and vegetables, avoiding obesity, exercising, drinking lightly and not smoking. Addressing these linked risk factors collectively results in multiple conditions being targeted simultaneously – heart attack, stroke, diabetes, cancer, chronic respiratory disease and Alzheimer’s disease, for example. Another important reason for a broad approach is that there are many different entry points into self-care, and one healthy behaviour can lead on to others. For example the smoker who manages to quit smoking is more likely to start exercising. Brushing and flossing teeth regularly will reduce the most widespread chronic disease of all – periodontal (gum) disease, but people should know that this can also slow the progression of atherosclerosis, a major risk factor for heart disease and stroke. Older people aiming to maintain mental acuity through crossword puzzles will learn that exercise can reduce the risk of Alzheimer’s by 60%. People may start anywhere in self-care, and engagement in one area can lead to interest in other areas, drawing people in to healthier lifestyles overall.